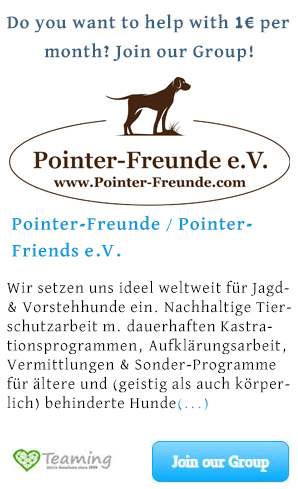 The Pointer - Pointer-Freunde e.V. The pointer – the mystery! Who or what is the pointer, anyway? If one reads on the Internet or circulated books for dogs, one can find a range of characteristics and descriptions as in hardly any other breed. From “hunting dog”, to a “breeding and exhibition dog”, a “pointer” or even of a “bundle of energy that will be required.” are mentioned. But then you can also find stories of “loving family dogs” who are with children and cats. I admit very confusing if you have not had any experience with the breed and want to inform yourself. Where then is the truth now? It is well known “in the middle”! 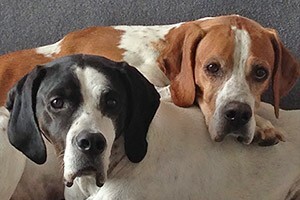 I personally have lived for several years together with my two English Pointers – Pointi & Zouzou. They are the reason why I sat down in recent years repeatedly with the breed apart and was downright shocked about everything I heard and read. A pointer-aid from the United States told me that the pointers in animal shelters and killing stations partially stand less chances of the so-called “dogs lists” since the breed either would hardly be known, their character and nature would repeatedly be described only with “Hunting and Gun Dogs” and therefore the placement opportunities are hardly given. My research began and extended worldwide on all areas: breeders, hunters, exhibitors, families, pointers Help. I wanted to hear all sides – made and make no differences and condemn initially no holder or owner for his “use” and his handling of pointers. Important to me is the knowledge of pointers, their origin, their development, and experience with pointers and of course to get to know people’s attitudes, who surround themselves with pointers. Again, everything was yet – startling, beautiful, interesting and new impressions to my now so loved breed of pointers. Whatever I learned made me more curious to learn more. Some coincided with my own experience of recent years of living with my pointers – but a lot was absolutely foreign to me. Thoughts like “maybe my two pointers are simply different, because they are rescued pointers” or “maybe I was also just fortunate with my two that they are different,” came to my mind over and over. But gradually, a growing number of people from across the world wrote to me and told me mainly in our Facebook group “Pointer-Freunde” of their experiences and there were more and more people who told me about their family members, the pointers. 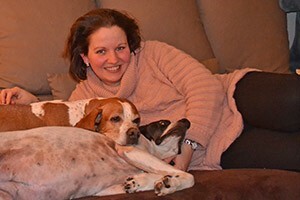 Of course there were also overlaps – breeders whose pointers are also full members of the family, they are allowed on the sofa, to be part of sleep in bed, with cats and horses and are acceptable and perfect “siblings” for the children. Finally, I thought to myself! They do exist – the people who deal with the other side of the pointer and not only take him hunting, go with him to exhibitions or as pedigree pointer breed (purebred pointers with papers). But I also found hunters and foresters, have the pointers and they greatly appreciate not only for their hunting qualities, but they view also as their partner. There are very well this side of the hunters – people who are concerned and view their dogs as well as a partner and / or family member. I think you should not first of all condemn. You have to listen, ask – also critically – and connect with many people to be able to form an opinion. And then I came across the next “powder keg”: What dog are you allowed to describe as a POINTER?! 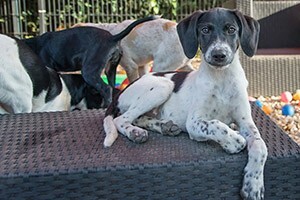 Is it the English Pointer, the German pointers such as the German Shorthaired or German Wirehaired or are there perhaps pointers Mixes also, which in my view are quite convenient to the group of pointers? Nearly forgot, for example, the English name of a German shorthaired pointer, where you can still find the word Pointer: German shorthaired pointer. We have deliberately decided to work for the group of the breed of pointers. These include for us purebred pointers such as the English Pointer, German shorthaired pointer, German wirehaired pointer, German Longhaired Pointer, as well as all pointer mixes, in which either the mother or father is a pointer. It is important for us to enlighten about the breed – the various sub-races and their particularities and characteristics. Find out more under the headings “Art and nature”, “Origin and History” and “own experiences”.